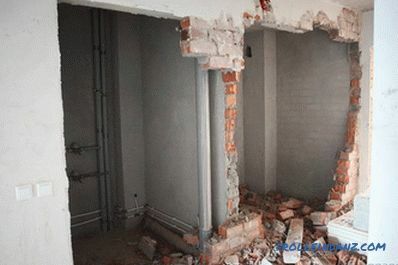 Before wallpapering walls, they need to be prepared for this process. 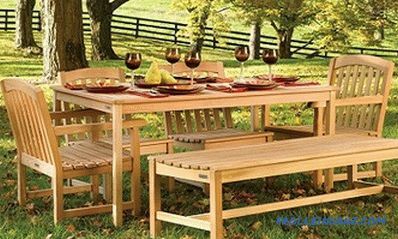 To do this, you will need to trim the edges and cut the sheets of the desired length. We invite you to familiarize yourself with the basic recommendations on how to cut wallpaper. 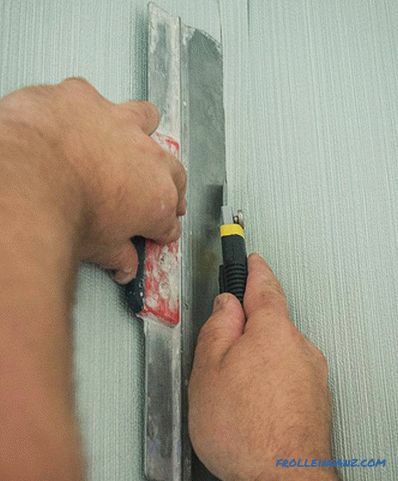 For cutting wallpaper, you can use a knife with segmented blades, which is usually used for cutting drywall, plastic and stripping electrical wires. 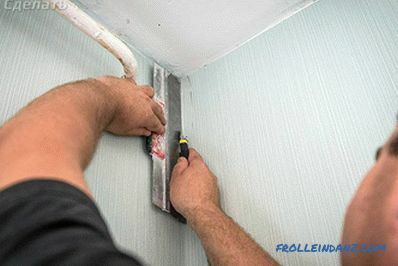 With this tool, you can easily cut the wallpaper up and down. 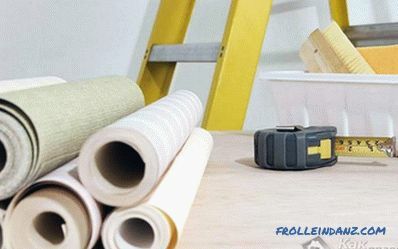 To cut the wallpaper as accurately as possible, you also need to purchase a building spirit level of 1.2-1.5 m long, which will be used as a ruler. However, it is easier and cheaper to use an ordinary rule or a wedge. 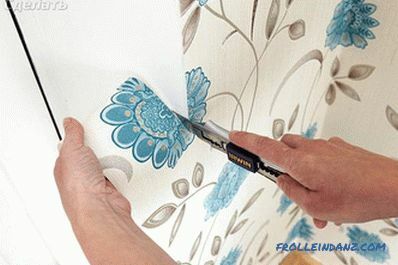 To trim the edges of the wallpaper, you will need sharp scissors of medium length (up to 200 mm). Before you start cutting wallpaper, prepare the floor by covering a film with a thickness of 80 microns. On it, you can later also be smearing the wallpaper with glue. First you need to count the number of whole bands. If the width of the wallpaper is 50 cm, then you need to measure the perimeter of the room. Let's say you have 10 m.
Now this value needs to be divided by the width of the wallpaper: 10: 0.5 = 20. This means that you will need 20 whole strips of wallpaper. Now pay attention to the length of the roll. It must be divided by the height of the room (in our case, 2.5 m), taking into account the report for combining the canvas. So, you get the number of whole bands in a roll. Then divide the required number of strips by the number of whole sheets per roll. As a result, you get a value equal to the number of rolls. 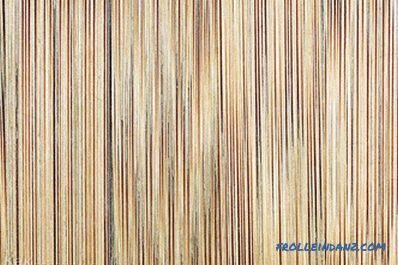 The standard roll length is 10 m. So, you have get 4 strips per roll. To find out the number of rolls, divide the number of whole sheets required for one room by the number of sheets in a roll. In our example, it looks like this: 20: 4 = 5. 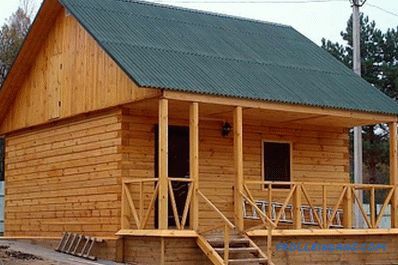 From this number you take away the area of ​​the window and doorway. They usually take 0.5 rolls. And that means you need 4 rolls of wallpaper. In reserve, it is better to take 1 roll more. Now you need to know the height of the ceiling. Measure height from floor to ceiling in all corners of the room. Suppose there are 4 corners in a room with different heights, namely 246, 247, 249 and 250 cm. In this case, the wallpaper is cut to its maximum size. In our example, this will be 250 cm. with pattern selection / offset. About how to properly cut each of these types of wallpaper and will be discussed further. This is the easiest method of cutting. At the maximum height of the ceiling, in our example - 250 cm, you can cut the wallpaper 1 cm less, that is 249 cm. This is due to the fact that you need to cut 1 cm from the top, and the baseboard will be 5 cm below. Wallpapers without a pattern are simply rolled face down and cut out in accordance with the height of the ceiling without offset. In this case everything is not so simple. Take for example the height of the ceiling - 250 cm. Next, we determine the pattern step, for example, 54 cm. All lanes should start in the same way. This means that you need to multiply the smallest number of the pattern, for example, 54 cm, and the height of the room (250 cm). Four steps of the drawing will be: 4 * 54 = 216 cm - this is insufficient for a whole sheet. So, we take 5 steps: 5 * 54 = 270 cm. 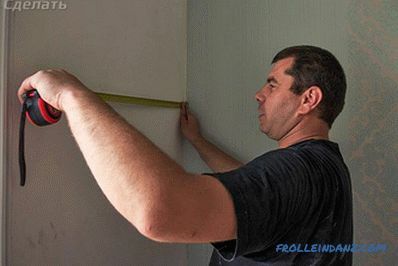 Thus, you need to cut strips of wallpaper with a length of 270 cm. Wallpapers with a pattern with offset is the hardest to cut. In this case, the bands will repeat in one. 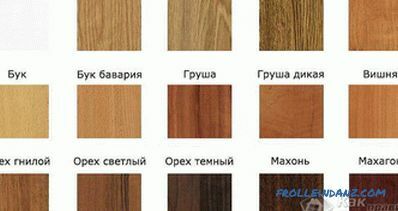 But first you need to complete the selection of the picture. For clarity, we denote the lanes on A and B. First, you need to calculate how many lanes of each type you need. For example, we begin to glue wallpaper from strip A (taking into account that the first strip is glued from the window), then strip B goes, then A again, and so on. In order not to get confused in the sequence of strips Wallpapers with offset patterns, number them on the wallpaper and, accordingly, on the walls. Suppose you need 20 sheets per room, of which 10 are strips A and 10 are strips B. Then determine the report of the drawing. For example, 64 and 32 cm respectively. Find the smallest multiple equal to 32 cm and greater than 250 cm (ceiling height from our example). You will have 8 * 32 = 256, this value is greater than the height of the ceiling indicated by us - 250 cm, and, therefore, such a cut suits us. From each roll you will have 2 lanes of the same type and one of the other. Start cutting from strip A, then you will automatically have strip B, then again A. Next roll you need to start cutting from strip B, then from strip A, and so on.If you cut the strips in such a sequence, then you will succeed in ensuring that they lie in the same sequence in which you stick them. And this greatly simplifies the task when joining the picture. The cutting of wallpaper in the corners is carried out in the process of sticking them to the walls. Therefore, it is important to familiarize yourself with each stage of the work process. The corners must be carefully coated with glue. Practice shows that wall covering is most often peeled off at the corners. 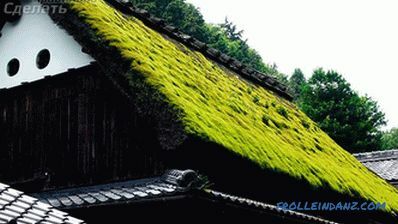 Apply glue with roller or brush. There are at least four corners in the room, so you have to perform these actions at least this number of times. Begin to glue the canvas with the least viewed point, that is, where the mistake you made will be less obvious. The sheet should be glued so that it slides at least 1 cm onto another wall. Press it firmly against the surface with a sponge. The next sheet is glued to the opposite wall. Using a tape measure, find the appropriate position of the angle. As a result, the sheet should go on the opposite wall with wallpaper 1-4 cm. Vertical line should be checked with a plumb. Glue the sheet and press it against the wall. Layers of sheets should be cut as close as possible to the corner. In order to cut the wallpaper in the corners you need a knife and a ruler. Excess pieces can be removed. Move the lightly pasted sheet of wallpaper and remove from it a narrow strip of wallpaper. Grease the turned edge with glue, and then press and smooth. Even if you have perfectly smooth walls, you should not glue whole sheets of wallpaper in the corners. In places of distortions after the drying of the wallpaper, wrinkles may form. A sheet of wallpaper is glued onto 8 flat walls with perfect corners. -10 cm. The following canvas must be pasted vertically at a distance of several centimeters from the bend. In this case, the width of the overlap should be 5-6 cm. The place of overlap should be cut through the center. This vertical cut should be as smooth as possible, and both layers of wallpaper should be cut at a time. After that, carefully peel off the top layer, remove the trimmed strips, glue the joints with glue and glue them back to the wall. This way you will have a precisely fitted joint. The outer corners are also found in the rooms. These can be door / window slopes. If you have to paste over even slopes with wallpaper, then everything is simple. So, glue the wallpaper on one side so that the edge of the sheet goes on the adjacent wall about 4 cm. Align and smooth the sheet of wallpaper. 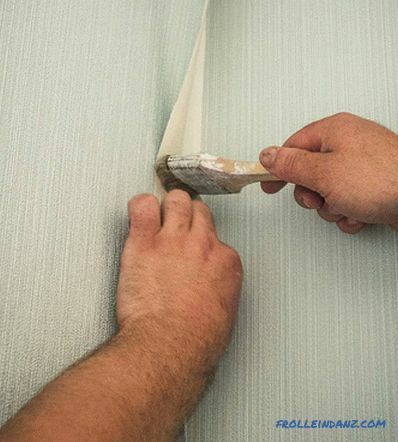 If there are folds and bubbles, then make a few small horizontal cuts on the sheet of wallpaper. Next, cut the wrapped edge of the sheet so that a small edge remains. Measure out the following sheet for work and glue to the slope. So, you get a little overlap. If you paste vinyl wallpaper, then in places of overlap, you should use a special glue. We hope that the information we have provided was helpful to you. If you have any questions during the reading of the material, then you can ask them to our expert. Want to comment on what you read? In this case, write to us. You can leave comments at the end of the article.